Our June meeting took place on Monday, June 18th at the Kennebec Cheesery hosted by Jean Koons while her husband continued getting their hay in during a promised stretch of sun. We toured her cheese room, which continues to improve in space and efficiency, as well as her changing milk room, which will add a pipeline milking system very soon. We had an excellent turnout including many apprentices, and we tasted quite a spread of workshop cheeses including a Gorgonzola that was over a year-old from the Peter Dixon workshop in 2011. It was mighty good, just coming into its own. We primarily discussed the next steps the Guild should take in a brochure, our last version having been printed over five years ago. 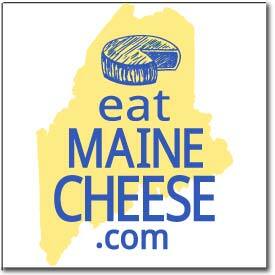 Karen Trenholm worked with the graphic designer Nancy Montgomery (who had designed our poster and show display) on a proposal for a “Maine Cheese Trail” map and listing that could be used for Open Creamery Day as well as year-round. But the group ended up approving a reprint of an updated version of the existing, less specific, brochure and then designing an insert that could be printed on two sides of an 8.5 x 11 inch sheet of paper to be used for mapping/listings or other updatable info, plus could be downloaded and printed by any member as needed. Robin, at Three Level Farm, will be heading that project.